Kenneth A. Strandvold, age 84, of Milbank, SD, died January 15, 2019, at the Milbank Care and Rehabilitation Center in Milbank. Funeral services will be held on Friday, January 18, 2019, at 10:30 a.m. at Living Word Lutheran Church, Milbank, SD. Visitation will be Thursday, January 17, 2019, from 5:00 – 7:00 p.m. at Mundwiler Funeral Home in Milbank and continue one hour prior to the service at the church on Friday. Pastor Kent Groethe will officiate, and burial will be in the Milbank City Cemetery. Kenneth Alan Strandvold was born on August 11, 1934, in Portland, Oregon, to Carl and Evelyn (Hanson) Strandvold. Ken moved to Milbank with his parents at the age of seven and has lived in Milbank since that time. He married Kay Kottwitz at First English Lutheran Church in Ortonville on September 11, 1955. Ken worked for the Standard Oil Service Station, Hunter Granite, and Storsteen Auto, but was best known as an insurance agent for thirty years with First National/Norwest/Wells Fargo Banks. Ken retired in 1996, and he and Kay spent their winters in Texas for the next twenty years. 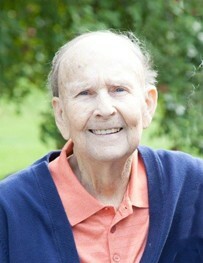 He was a member of Living Word Lutheran Church and the Antique Car Club. Ken was especially fond of his old cars: a 1966 Chevy Impala Convertible, a 1956 Ford Crown Victoria, and a 1966 Ford Mustang. He was also an avid golfer. Ken and Kay enjoyed traveling all over the world. Ken is survived by his wife, Kay; daughter, Karla (Gary) Wellnitz of Milbank; grandchildren: David, Jason (Amber), and Michelle; and two great-grandchildren: Treyton and Benson. He was preceded in death by his parents; son, Keith; and brother, Phil. When Ken would say good bye, he would do the Hawaiian sign and say, “Hang Loose”, and walk away with a smile on his face. Memorials are preferred to “It only Takes a Spark” cancer walk.